LEAGUE champions Arsenal Ladies will bounce back from the shock departure of two key players, says captain Faye White. The Gunners were rocked this week when striker Lianne Sanderson and versatile defender Anita Asante signed for London rivals Chelsea. 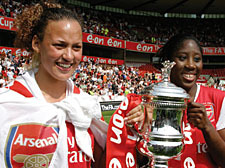 Leading scorer Sanderson, 20, and Asante, 23, have been at Arsenal for over a decade and played a major role in the Gunners’ Quadruple winning 2006/07 season. Asante, once tipped as a future Arsenal captain, revealed that telling manager Vic Akers was “probably the hardest thing I’ve had to do in my life”. Their departure, coupled with assistant coach Emma Hayes’s move to professional American side Chicago Red Stars, means life could be hard for the champions next season. But White remains confident: “We’re disappointed because it’s two talented players but they wanted a new challenge. It’s happened before and we’ve come back just as strong so we’ll be looking to do that again,”she said.